Petersburg School District’s Director of Activities, Jaime Cabral, and his wife Heidi chaperoned the trip and told the school board about it. They showed videos of the students learning traditional dance in Sitka. Jaime Cabral says the students call themselves ‘P.I.N.G.’ for Petersburg Indigenous Native Group. It’s the third year the group has gone on an educational cultural trip. In Juneau, the students visited the University of Alaska Southeast, the Sealaska Heritage Institute, and the Tlingit and Haida Community Center where they celebrated Elizabeth Peratrovich Day. In Sitka the group went to Mt. Edgecumbe’s Founder’s Day celebration. They learned dancing from Stephen Blanchett who leads cultural programs around the state and is also part of the Grammy Award-winning music group, Pamyua. In Sitka, the students visited ancient totem poles at the Sitka National Historical Park. They also visited Castle hill where there are still cannons that were used by the Russians to displace the local Tlingits from their land. 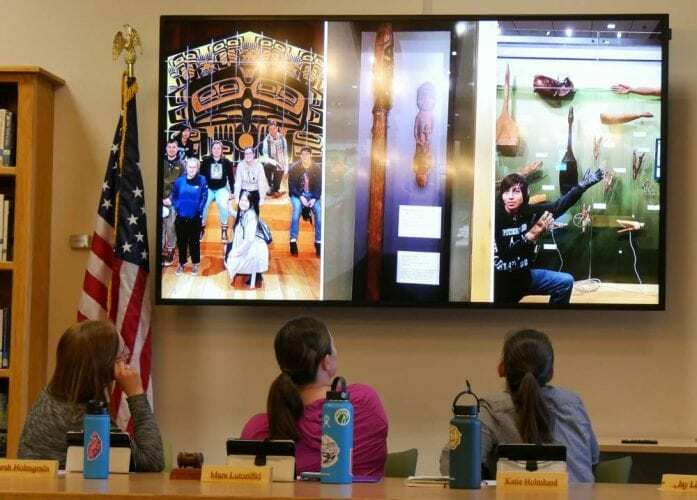 The students visited the Sheldon Jackson Museum, which holds artifacts from indigenous cultures throughout Alaska and from the Northwest Coast. They also went to the Raptor Center. Cabral says several of the students are creating family trees, learning their language, and joining the Alaska Native Brotherhood and Sisterhood’s local camp.